Catapult has everything you need to keep your convenience store quick and competitive. When you’re running a convenience store, speed is key. Your customers aren’t looking for a time-intensive trek through your store; they want to get in, grab items, and go. C-Store operators need a POS platform that’s configured to this reality: a comprehensive commerce system that provides ultra-fast transactions, fuel integration, accurate inventory management, and easy-to-use back office management tools. 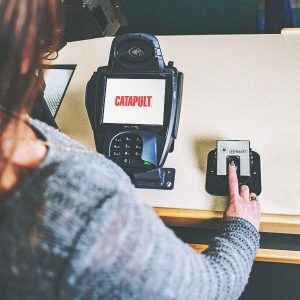 Catapult is ECRS’s award-winning enterprise point-of-sale solution for C-stores of all sizes. Catapult provides the real-time actionable data retailers need to make smart business decisions in a highly competitive marketplace. Catapult’s optional fuel integration and self-checkout make it the solution choice for C-store retailers who require a comprehensive, efficient retail framework to manage their enterprise data and streamline their workflow. Catapult goes beyond omni-channel and it’s more than unified commerce. It is scalable and responsive thanks to Unified Transaction Logic™. This means all critical areas of operation in a retail enterprise are all connected in real time. Your traditional checkout lanes, self-checkout terminals, pharmacy, fuel, web orders, and even smartphone apps all work as one. It is a comprehensive solution that enables efficient HQ management for convenience store retail. No matter your store layout or scale, Catapult can cover all of your transactions at lightning-fast pace. All transactional information from all of your retail touchpoints synchronize to the system for real-time, precise business analytics. Catapult can process thousands of transactions in the most demanding of convenience store environments while continuously feeding data to Catapult Web Office for real-time, precise business analytics and inventory management. All transactional information synchronizes to the system for real-time, precise business analytics. Catapult has the power to process all transactions, across your enterprise, at every retail touchpoint. Whether you’re running one location or a chain of C-Stores, Catapult can cover all of it at a lightning-fast pace, no matter the customer volume, time of day, or method of transaction. Hot keys empower cashiers and unnecessary steps are eliminated; they can speed through transactions and member management operations all from the point of sale. Customizable touch screens with hot keys empower cashiers, unnecessary steps are eliminated; they can speed through transactions, manage fuel, or access customer loyalty data, all from the point of sale. Expanding the options that customers have for self-checkout will aid your store in providing convenience and speed. With a friendly and engaging automated self-checkout system retailers can expect reduced lines and labor costs. Catapult senses when a customer has abandoned a transaction and voids and records the sale, minimizing the need for human associates to intervene. The system will learn the weight of merchandise in your store when scanned. Weights are recorded and replicated to every store in the enterprise. ECRS offers a number of hardware options for self-checkout, click here to find out more. Your cash register should be frictionless to the customer’s purchasing behavior. Catapult has a variety of ways to pay, including several Canadian payment processors to choose from. Payments can be processed using Credit & Debit with Canadian Pin & Chip, NFC Touchless Tap & Pay, Apple Pay, no transaction fee self-hosted gift cards, and even third-party gift cards. At the press of a finger, customers can access an associated account with Secure OneTouch™. They can instantly make payments without cards or cash, collect points for loyalty, and apply e-coupons and in-store discounts in real-time. The ECRS Open Fuel Server (OFS) integrates seamlessly with Catapult to provide a powerful, cashier-friendly C-store system that handles fuel sales and other transactions within the same POS interface. OFS lets cashiers easily manage all fuel pump activity from the POS touchscreen, from pump authorization, to pre-sets, to pre-pays, the OFS empowers cashiers to manage all fuel dispensing stations from behind the counter. Cashiers can manage stacked sales, disable selected pumps, and even stop fueling on the fly if required. The OFS makes collecting payment for fuel sales simple and fast. With just the single touch of a button, cashiers send fuel sales into the transaction journal alongside other items for purchase. The ECRS Open Fuel Server allows store operators to access and set up virtually all aspects of the system locally or remotely from a web browser. Users with proper security clearance can edit pump controller functions, POS interfaces, store promotions, reports and much more. The ECRS Open Fuel Server provides the tools required to efficiently deliver a multitude of targeted impulse messages to consumers at the pump on both the LCDs and on printed receipts. The OFS lets C-store retailers effectively capture customer mindshare during those middle moments while fueling by broadcasting dynamic promotional content directly to the pump screens and to printed receipts. Catapult has full-spectrum inventory capability to synergize supply chains. It can replace your current inventory management software and cut down on complexity. Connect your inventory controls to the rest of your store operations, seamlessly. Catapult tools cover supplier integration, inventory management, auto-replenishment, warehousing, pricing & promotions, and new item management. Perpetual inventory helps to avoid stock-out scenarios and keeps fresh food orders flowing at optimal pace. Order Assist™ module displays displays suggested item order quantities based on forecasted auto-replenishment calculations and can then generate a purchase order for each associated supplier. Purchase orders are made easily through supplier integration and bi-directional communication via EDI (Electronic Data Interchange). Catapult will also submit inventory orders through other mediums allowing you to send one purchase order to an EDI supplier, then another via fax, and then another to email, all depending on your vendor’s capabilities. While you’re on the floor, you can easily print easy to read, high contrast shelf labels using a portable label printer. Now store associates can print shelf labels on-the-fly from anywhere in the store! Use the ECRS-powered UPD to put our data in your catalog with lightning speed. The UPD includes valuable information like health attributes, brand, item image, size, receipt alias and suggested retail price. With Catapult your discounts, dynamic promotions, rewards programs, and other transactional processes work the same. At the front-store and online, your customer relationship management tools all work in unison. Laws vary greatly from province to province and compliance can be particularly difficult for chain stores where each location may have different regulations. The Catapult system supports localization and provides any required compliance reporting. Catapult quickly scans local IDs for buyers and verifies that the format of the ID is correct. You can easily confirm your customers are 18 and avoid fines and penalties. Now you’ll be able to take the guesswork out of age verification. Catapult generates up-to-the-second reports for every area of your business, including inventory levels, current sales, and historic sales. Users can immediately determine what quantities are on hand, on order, and sold, as well as ascertain costs, profits, and all data critical for staying competitive and profitable. Users can analyze net margins for any number of parameters, including by item, by brand, or by supplier. Catapult offers hundreds of reports to help you make informed business decisions. 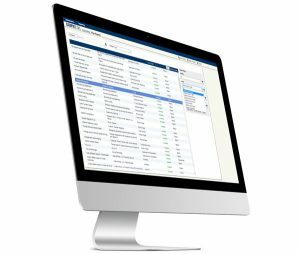 What features should I be looking for in a C-Store POS system? A truly seamless and scalable convenience store POS needs to be running in real time across the enterprise. It should do more than simply ring up transactions, it should tie together the majority of store systems and services to reduce friction. The ideal system should be using the information gathered at the POS to generate reports, monitor inventory, and offer insight to enterprise executives. For more detailed insight into what features you should be looking for in your next POS system, check out our comprehensive guide. What kind of convenience stores can Armagh service? Catapult is versatile. Whether you run a corner store, a single location, or a regional chain of stores, our system and hardware solutions can cater to your scale and your needs. My enterprise still uses a silo system, how can I move to unified commerce? Catapult is flexible. It can be configured to work with any commerce tools you wish to keep, for any length of time. We’ve established a process for store operators to make the transition without interrupting their operations.